According to this post in drupal.org, multi-byte UTF-8 support for MySQL and other database drivers, allows emojis, Asian symbols, mathematical symbols, etc with your Drupal 7 installation. The only caveat to this is that your Drupal installation must be at least Version 7.50 or higher. These settings are available as of MySQL 5.5.14, and are defaults in MySQL 5.7.7 and up. After editing the my.cnf file (often located at /etc/mysql/my.cnf), don't forget to restart the mysql service (for example, with the command sudo service mysql restart) in order to load the new configuration. 2. The PHP MySQL driver must support the utf8mb4 charset (libmysqlclient 5.5.3 and up, as well as mysqlnd 5.0.9 and up). 3. The MySQL server must support the utf8mb4 charset (5.5.3 and up). Run the command mysql --version to see your current MySQL version. 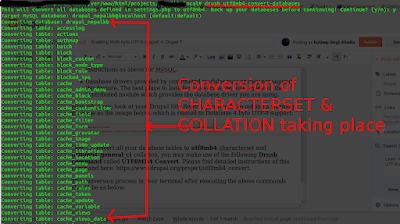 First, back up your database and convert all existing tables to utf8mb4, such as by using the drush command provided by the utf8mb4_convert contrib project. PostgreSQL and SQLite support 4-byte UTF-8 out-of-the-box, so no special changes are needed for these. MariaDB and other MySQL equivalents should likely work with similar instructions as above for MySQL. Database drivers provided by contributed modules may or may not support this feature. The best place to look for answers is the issue queue of the contributed module which provides the database driver you are using. Now to convert all your database tables to utf8mb4 characterset and utf8mb4_general_ci collation, you may make use of the following Drush command called UTF8MB4 Convert. 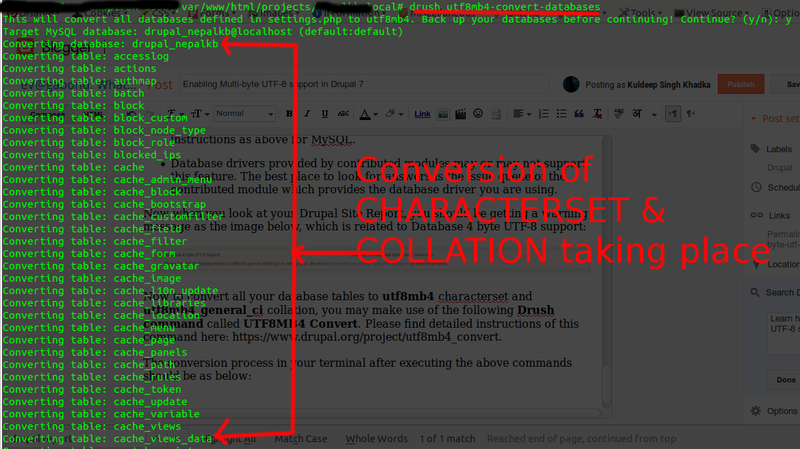 Please find detailed instructions of this command here: https://www.drupal.org/project/utf8mb4_convert. Finally when all your tables are converted, you can view each of their's Collation by using any database management tool such as phpMyAdmin. Finally your Drupal site should display a message like this, confirming successful enabling of Multi-byte UTF-8 support. 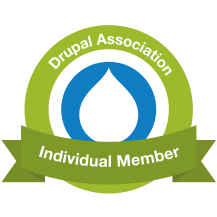 That's all there is to enable multi-byte UTF-8 support in Drupal 7.